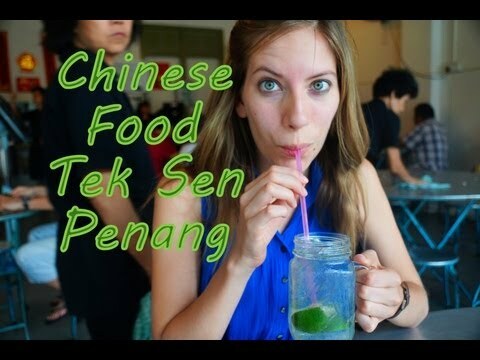 To satisfy our most recent cravings, we headed over to a popular local Malaysian Chinese restaurant (Tek Sen) to sample crispy chicken saturated in plum sauce, mapo tofu, Chinese fried rice and lime juice for lunch in George Town, Penang, Malaysia. Tek Sen, is a restaurant I’ve been wanting to try for several years. When I was in George Town, back in 2011, I tried searching for the restaurant on foot without any success. Luckily this time around, with a little help from Trip Advisor maps and an updated Lonely Planet guide, we were able to spot this gem of an eatery that is massively popular with locals. On the menu, which was rather extensive, specialty dishes were highlighted with a little star next to them. One of the dishes most highly recommended in reviews, and with a star in the menu, was the crispy chicken with plum sauce. Another one of my personal favorite Chinese dishes (and one Audrey had yet to sample) was Mapo Tofu, considered one of the house specialties as well. We needed rice or noodles to go with these two dishes so we selected Chinese style fried rice. Given that it was such a hot and humid day (honestly, when is it ever not in George Town) we also ordered some refreshing lime juice drinks to help was down our meal. When our dishes finally arrived I was a little bit surprised that the portions weren’t larger. I’ve come to expect *big sized* dishes from my previous experiences eating Chinese food in Canada and abroad; however, what was lacking in size was certainly recovered in terms of quality. First we tried the Mapo Tofu (a Chinese dish from Sichuan region with a tofu base situated in a bean based sauce garnished with chili) and it compared favorably to other times I’ve tried it elsewhere. Next up was the crispy chicken drowning in plum sauce. I have to admit, this was by far my favorite (also Audrey’s favorite). The chicken strips just melted in our mouths and the sweet plum sauce with a hint of chili really added an explosion of flavor. The fried rice, although quite standard, was a nice compliment to our two main dishes. The lime juice, served in a generous sized mug, really helped keep us cool during the meal. Audrey, who isn’t a huge fan of Chinese cuisine, found the meal delicious which is a ringing endorsement to the overall quality of the food. Overall, the meal was fantastic (and considering I’m on a diet) the portion sizes were just right. We left feeling satisfied but not stuffed. For those interested in visiting this restaurant it’s just off of Chulia street nearby the Chinatown district of George Town. The meal was an affordable 33 Ringgits (roughly $11 USD) which we thought was great value for three dishes, two drinks and a water. This restaurant ranks as one of favorites in Penang and we highly recommend you check it out for yourself. Looks really delicious! You know it’s always good when locals dine there! Thanks for sharing your review! Moo-Shi is a Northern Chinese cuisine that has been well accepted by American Chinese food lovers. It is prepared with scrambled eggs, shredded cabbage, scallions, bamboo shoots, and wood mushrooms. All Moo-Shi dishes are served with thin pancakes and Hoisin sauce to wrap up the mixture. Served with four pancakes. Extra pancakes $0.35 each. MMMMMMmmmmmm! That sounds really good!